"A beautiful holiday house in the village of Bempton close by Flamborough Head and ideally situated for exploring the idyllic beaches and cliffs of the Yorkshire Coast and the vast expanses of the Yorkshire Moors, near the seaside towns of Bridlington and Filey. The house provides luxury self-catering accommodation and is ideal for large groups and can sleep up to 12." Booking details, availability calendar, terms and conditions. Bempton is a small village on the Flamborough headland of the Yorkshire Coast. 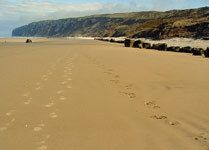 Miles of award winning stunning sandy beaches lie to the immediate north and south of Bempton. The village has a pub and a post office; an antiques yard; a 12th century church and a duckpond! The local pub is a minute's walk away and serves food. Essential supplies can be found at the well-stocked shop and Post Office a minute's walk up the street. "A very special holiday house - spacious, sumptuously furnished, loads of space for the kids to get lost safely, loads of toys + games for the kids, Bempton is a lovely village, RSPB reserve is breathtaking. We don't often repeat holidays but seriously thinking about another Walmsley visit in the near future." "We thoroughly enjoyed our stay at the Walmsley House holiday cottage. We went with a group of friends and their children to celebrate my birthday. The house is spacious, comfortable, well organised and with lovely interior décor. The children loved cuddling up in the snug together and we all appreciated the large dining room table, so that all 13 of us could eat together." "The house was ideal for us. We could all fit round the table with the tinies in the highchairs. This was important as we had 3 birthdays to celebrate that week! Also very easy to clear up after each meal, because of all the space in the diningroom. Having such a variety of downstairs rooms really helped. It meant that a range of activities could happen at the same time, and that the boisterousness of the children never felt overwhelming! They spent a lot of time inventing different games in the garden. That was another plus, both garden and house are comfortable and unfussy." "A very relaxing environment in which to take a break. Very comfortable and homely let. A fabulous and well-equipped kitchen; the conservatory is a lovely place to relax in. All in all we thoroughly enjoyed our stay." Prior to arrival we nicknamed the weekend ‘the cottage’ which was the biggest understatement ever; the house is huge! Excellent value for money, the house was immaculate and comfortable - a real home from home. A beautiful holiday let near to wonderful beaches. It had everything we needed and was so well-equipped. Why Choose Our Holiday Cottage? We are located on the Flamborough Head near to lots of stunning sandy beaches but also close to the North Yorkshire Moors. Walmsley House is immaculate, recently decorated, has all the modern conveniences and a beautiful private south facing garden. We can cater for large groups and the house is perfect for extended family get-togethers. We have 3 large public rooms so people can spread out and a beautiful snug with home-movie system. Our holiday home is pet-friendly. Feel free to bring your dog or cat. Summer Weeks Still available 2019!